LT Personal is responsive business Joomla template. This is great template used for Profile or Personal service websites to display your personal detailed information on your website. In addition, it allows you to express your own ability and helps employers find the human resources. 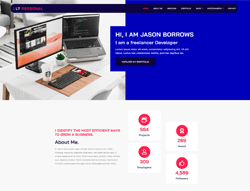 LT Personal builds on powerful framework with 100% responsive layout (support for mobile devices) based on Bootstrap CSS grid layout, Page Builder for layout, Shortcode for present content easily, Support Font Awesome, Compress files and so on. Besides, 4 color schemes are also included. If you're freelancer, create new website for your personal service.